Erin Meadows was happily going about her job as a paralegal at Ford Motor Credit Company, LLC, being a wife and mother to two daughters (8 and 11), and serving in the U.S. Navy Reserves. 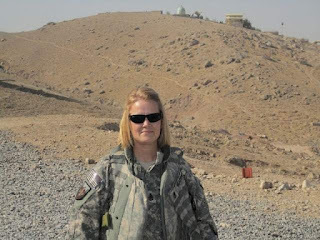 That all changed when she received her orders to report for duty and found herself on a base in Kandahar, Afghanistan, where she dressed in combat garb and carried 40 pounds of equipment - including a weapon, even though her duties consisted of paralegal work on an investigative team. Erin is now back in the U.S. with her family and, again, back at her paralegal job. Recently she participated in a Ford-sponsored video spot where she talked about her deployment to Afghanistan and the support she received from her family of coworkers. She is one of eight Ford employees featured in the spot that thanks veterans for their military service. “It's a pretty good show,” Meadows said, adding that during the first episode, the women celebrities reported for duty “all prim and proper and with their hair done. In 120-degree heat that hair in Afghanistan would not be all done up,” she quipped. Hairstyling was the least of her concerns while serving as a paralegal, assisting the Army in Afghanistan from April 2010-May 2011. She was stationed on a base in Kandahar that often drew rocket attacks. Sometimes she flew to other bases on an armed Black Hawk helicopter, aware that it also was a target. “We probably had more than 100 incoming rockets. They happen when you least expect it — in the middle of the night, during dust storms, Meadows recalled. According to the story published by the Observer & Eccentric it wasn't exactly the scenario Erin, 41, had envisioned when she entered the Navy 22 years ago. The Dearborn, Michigan native was majoring in travel and tourism at Eastern Michigan University, but growing tired of her armchair excursions. After watching a Navy commercial on television one night, she surprised her parents by announcing her intention to talk with a recruiter. She signed up and worked in communications for four years, spending time in Iceland and in San Diego, Calif.
Erin was in the Navy Reserves when she married. She used her GI benefits to earn a bachelor's degree in English from Madonna University and completed paralegal studies at Eastern. Both her day job at Ford and her Reserve assignments involve paralegal work. As a senior paralegal with the Navy, she manages other paralegals in the Reserves. Thanks, Erin, for your service to the United States and for your dedication to the paralegal profession. To read the full story, follow this link. Paralegals: Are You Stuck in the "Someday" Trap?